Laura Ashley is always a great buy. 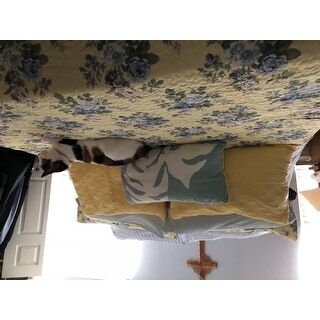 This elegant Laura Ashley European sham set includes 2 quilted European shams. The shams can coordinate back to our best selling quilt patterns, or use alone to update your bedding. Shams have a quilted face and feature hidden zipper closures. The shams are crafted of 100 percent cotton and coordinate with our Linley quilt collection. Use these shams to add layers to your bed, work back to our Laura Ashley quilts or use to update other bedding collections in your home. Laura Ashley Linley Quilted European Sham Set is absolutely beautiful, I bough it to complete my Linley set, but it match with other set of Laura Ashley very well. Very nice Laura Ashley Shams! These particular shams co-ordinate with one of the Laura Ashley quilts sets that I had bought for my mom, and after filling them with a sham pillow, they are soft and cozy and cuddly, just what you want them to be! 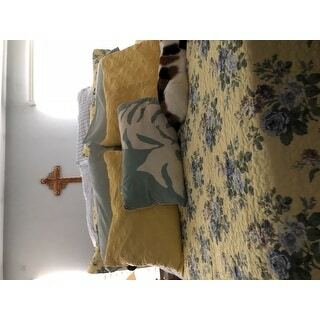 My mom uses both of them all the time to prop herself up in bed to make herself more comfortable or to find a more comfortable position. They go with the Laura Ashley quilt set great! Highly recommend! I have the Laura Ashley Linley king size comforter set as well as the matching window valances and full length drapes and I thought that the matching Euro shams would complete the look of this beautiful comforter, drapes and window valances. I am delighted with the design of the comforter, especially due to the reversible feature. It's a lovely floral design on one side and the reverse print is a blue and white pin stripe. The Euro shams are the blue and white pin stripe and compliments the look of the decor. The quality of these coordinating items is excellent! I highly recommend this product! Thank you, Overstock for another fine product! These shams and the entire Linley quilt and daybed set are simply lovely. Adds a wonder pop of color to the room. I truly love it all ! 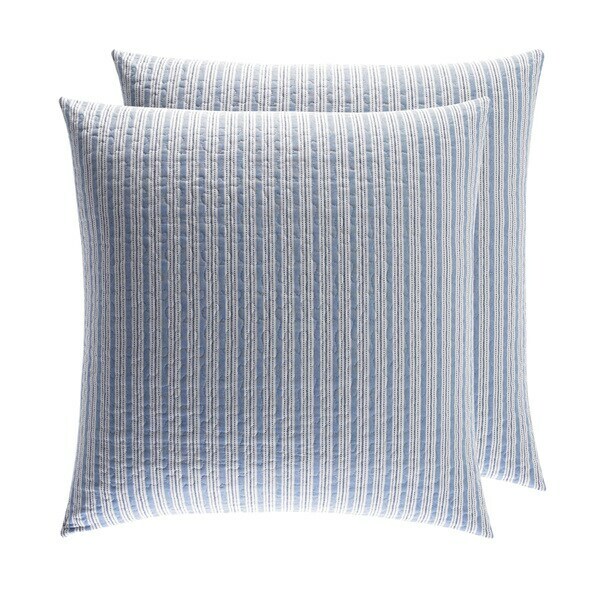 When I ordered these to go with my Laura Ashley Linley comforter set, I thought they were actual throw pillows. Once I received them though I realized that they are actually pillow shams and I love them. They match the Linley set wonderfully. I am going to order another set. Really pretty, good quality, Exactly as advertised. Unfortunately I'll have to return them due to the color not matching. I don't think I'll be making any more purchases online when color matters. It's just impossible to tell when looking at pictures due to-lighting differences, monitor differences, etc. But these are nice and I would keep them if they matched. Fast service from Overstock. I bought theses pillows to go with my yellow Laura Ashley quilt. They are very well made. White with a light denim blue colored stripe. They are fresh and beautiful. Love! Love this euro sham set. I ordered it to match the beautiful Laura Ashley comforter set. My bedroom looks beautiful. I loved all of it. Would recommend all items that I have purchased. These pillows are nice. I purchased to match the bedspread but needed more like a standard or queen/king size, but that is a personal preference for what I was looking for. The product was good. I love these square pillow shams. Be warned though the pillows are a bit pricey. Just depends on what your priority is. We spend a great deal of time in our bedrooms; shouldn’t we want the best? Beautiful and elegant look to my bedding. I have received more compliments about about bright and cheery the set is. It is a great yellow with nice compliment of blue. Well made and is just perfect. I would recommend this set!! It matches the quilt I have.